Filipinos Philippine history tells us that our country had been ruled by three foreign colonizes Spain, America, Japan from 1521 up to 1946. For more than four hundred years the ought courageously and heroically to gain freedom and independence. While it is true that some Filipino leaders handled low level positions in government in any of the periods of dominance, yet those officials were considered as puppets. When America overthrew Spain in 1898 she established a military government, opened schools , and introduced English as a medium of communication for the purpose of implanting unity and understanding among the Filipino people who speak diverse dialects. It was during the American Regime when the Filipinos began to learn the ways of democratic governance, especially when Manuel L. Quezon became the President (in 1846) of the Commonwealth Government, and followed by Manuel Roxas as the first President of the Republic (in 1853). Just like any other municipality in the country, Calbayog had her own Chief executives during each of the aforementioned regimes up to the present. During this time, the Chief Executive was called Capitan Municipal. These executive were Rufino Pido (1886-1887), Pedro Matudan (1888-1889), Pablo Camilon (1890-1891), Pablo Jaropojop (1892-1893), Antonio Tarrayo (1894-1895), Anacleto Rueda (1896-1897) and Catalino Jaropojop (1898-1899). The American Regime may be divided into three stages: when the Philippine government was a government of Americans assisted by Filipinos (1898-1916), when the government was run by Filipinos with American help under the Jones Law (1916-1935), and when the government was entirely in the hands of Filipinos with an American High Commissioner as an observer during the Commonwealth Period (1935- July 4, 1946). The top executives were called Presidentes Municipal. These chief executives were Anastacio Pido (1900), Rufino Pido (1901), Hugon Rosales (1902-1910), Ildefonso Rosales (1910-1913), Luciano Ortiz (1913-1916), Buenaventura Rosales (1916-1919), Senecio Mancol (1919-1922), Cesario Ortiz (1922-1925), Anastacio Pido (1925-1928), Buenaventura Rosales (1928-1931), Ireneo Ortiz (1931-1934), Tomas Gomez (1934-1937) and Donato Tubal (1937-1939). With the fall of the Philippines into the hands of the Japanese invaders during the Pacific War (World War II), the Commonwealth Government was transferred in exile in Washington D.C. from May 13, 1942 to October 3, 1945. The local chief executive was called Mayor. The municipal mayor was Pedro Pido (1941-1945). With the liberation of the country from the Japanese Occupation, the Municipal Mayors of Calbayog were Rizal Ortega (1945-1946) and Pedro Pido (1946-1949). The Philippines was granted independence on July 4, 1946. And when Calbayog became a chartered city, comprising the Municipalities of Calbayog, Oquendo and Tinambacan, on July 15, 1948, the city mayors were Pedro Pido (1948-1953), Jose Roño (1954-1967) and Amado Ygrubay (1967-1971). The City Mayors during this time were Pablo Lucero (1972-1982) and Ricardo Tan (1982-1986). With the downfall of President Ferdinand Marcos as a result of the EDSA Revolution in February 1986, Corazon Aquino was installed as President of the Revolutionary Government. She revamped the officialdom and appointed officers-in-charge (OICs). In Calbayog City, Dr. Godofreda Dean (Apr. 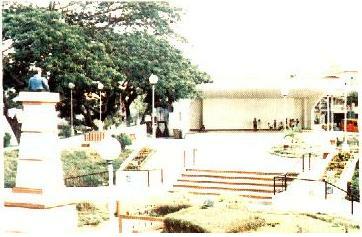 16, 1986 Dec. 2, 1987) was appointed OIC City Mayor by then DLG Minister Aquilino Pimentel. When Dr. Dean filed her candidacy for the mayoralty position in the February 1988 local elections, President Aquino instructed then DLG Secretary to appoint Narciso Y. Miano as OIC City Mayor (Dec. 2, 1987 Jan. 6, 1988). From January 7, 1988 up to February 2, 1986, DLG Operations Officer Manuel Lagrimas was the OIC City Mayor by virtue of the appointment issued by DLG Secretary Luis Santos. On February 3, 1988, Roberto S. Rosales assumed office as the newly elected City Mayor (1988-1992), the first mayor in Calbayog City to be elected under the 1987 constitution. During this term, Calbayog became a first-class city. Two of his landmark projects are the public market (Phase I and Phase II) and the fishport. In the elections in May 1992, Dr. Reynaldo S. Uy was elected city mayor (1992-2001). By May 14, 2001 Mel Senen S. Sarmiento had won the election and assumed the post July 1, 2001 up to this date. In parting, while political freedom was achieved in 1946, a novel form of the same problem freedom from want stares our poeople in the face as they thread the third millennium. Our present crop of leaders may well be advised to take a look a look at the past and learn from it as they grapple with the future in an effort to provide a better life for our people. By: Patrio M. Barandino, Jr.
Calbayogs early history has been associated with the introduction and spread of Catholicism in the country. Calbayog started as one of the small settlements in the Island of Samar, an area assigned to the Jesuit missionaries. Jesuit Chroniclers, as early as the 17th century, notably Fr. Ignacio Alcina, wrote many accounts about it and its people. Eventually from being a visita, Calbayog became a pueblo (town). It was created a separate parish in 1785. Separated from the ecclesiastical jurisdiction of the parish priest of Capul, it was later given it s own minister. What is noteworthy is the fact that on April 10, 1910, the Diocese of Calbayog was created by virtue of the Papal Bull of Pope Pius X. The diocese comprised the Islands of Samar and Leyte. Calbayog became the seat of the diocese. It was only much later that the other dioceses in the region were created. Republic Act No. 328, otherwise known as the Charter of the City of Calbayog was signed into law on July 15, 1948 by then President Elpidio Quirino. Calbayog as a city with its first set of city officials was inaugurated on October 16, 1948. The city comprises the territorial jurisdiction of the former Municipalities of Calbayog, Oquendo and Tinambacan. Our Local City's Hero: Sr. Don Benedicto P. Nijaga History! Twelve days after the tragic execution of Dr. Jose Rizal, thirteen Filipino martyrs were shot to death by musketry in Bagumbayan, now Rizal Park (formerly Luneta Park) dubbed in Philippine History as the Trece Martires de Bagumbayan, they were charged of treason, sedition and rebellion by the Spanish Government. One of the thirteen Filipino martyrs with different history of their own, is Don. Sr. Benedicto Nijaga y Pelenio, a native of Calbayog, Samar. Biktoy, as he is fondly called in Calbayog among his peers was born sometime in 1864 to a family of farmers who lived in Sitio Caballero, now Brgy. Rizal I. Farming at that time was so hard for the Nijagas, so that they forced Biktoy to work at the age of 10 in a convent. He worked as a Knight of the Altar (Sacristan) all day long by himself just to earn something for their familys daily subsistence. He was under the tutelage of Fr. Sebastian Cordova who was the Parish Priest (Cura Parroco) in Calbayog at that time. Biktoy is remembered by his friends as a very athletic individual, lover of nature, courageous, brave and above all patriotic. In 1878, Calbayog was hit by a very dreadful disease-cholera, killing almost one half of the total population. Fr. Sebastian Cordova, force himself to leave his convent to spare his life from the cholera epidemic. Little did we know that Fr. Sebastian was so king enough to save also Biktoys life by taking all the means to leave Calbayog for Manila and bringing Biktoy with him as his sacristan. There in Manila, Biktoy was given all the opportunities in life where he could study. He was a working student then, serving the convent without sacrificing his studies. One year after his graduation, Fr. Sebastian Cordova recommended Biktoy to work in the Spanish Army. He was trained and accepted as corporal. After a year, he was promoted and commissioned to become the second lieutenant in the infantry batallion of the Spanish Army. His first assignment as an officer was in the Visayan Region (the whole of Visayas). He always found time to visit his family, friends and fellow Calbayognons in Calbayog, Samar while on duty. In fact, he never missed a single moment without seeing his fellow Samareños wherever he traveled in the eastern parts of the Visayas. Biktoy was so generous and affectionate to women but there is no record on hand that shows him to be married. His loyalty and dedication to his duty as an officer in the Spanish Military maybe one of the reasons why until his death he remained to be a bachelor. Spanish and military atrocities remained to be the daily menu of the Indios. After the exile of Jose Rizal in Dapitan, the Katipunan was born in Binondo, Manila.Andres Bonifacio and his men moved heaven and earth to fight against the Spanish government then led by Gob. Heneral Polavieja. The katipunan expanded its membership from Luzon down to the Visayas Region, thereby increasing the number of Katipuneros in a span of one year. Spanish authorities were alarmed by the existence of the KKK or the Katipunan. Sensing the secret plan of the Katipunan to overthrow the government, the Spaniards conducted a raid in Binondo printing press where subversive documents were found and confiscated. One of the documents seized was the list of members of the Katipunan. The name Benedicto Nijaga was one in the list, being the collector of revolutionary funds in the area. Upon knowing the secret, Gob. Polavieja ordered arbitrarily the arrest of all suspected members of the Katipunan. Benedicto Nijaga was arrested together with twelve other katipuneros while campaigning for revolutionary funds. Shortly after they were jailed and tortured, farcical trial ensued which was reminiscent of the fate that likened Dr. Jose Rizals trial as well as those of other Filipino martyrs. They were convicted and sentenced to death. At the early dawn of January 11, 1897, the thirteen unfortunate patriots were taken to Bagumbayan field under heavy guard. A huge crowd of Filipinos and Spaniards witnessed the very tragic moment. Just before the sun rose, the trece martires bravely faced their final breath to death. The execution of these thirteen martyrs of Bagumbayan was invariably another stain on the colonial superiority of Spain. They were victims of Spanish misrule and injustice. Their death was not in vain for their blood soaked Bagumbayans soil and watered the seeds of Filipino freedom. We have celebrated the Centennial Death Anniversary of the Thirteen Martyrs with full pride and honor. As a Filipino and a Calbayognon, Im honored and proud to have a fellow Calbayognon Sr. Don Benedicto Biktoy Nijaga as one of the Thirteen Martyrs. MABUHI KA BENEDICTO BIKTOY NIJAGA!